On Monday I’m going to start living as close as I can to a 1916 lifestyle for two weeks. Naturally, this means I need a wardrobe. A whole wardrobe post is coming, but for now, let’s start with the item everyone is really interested in: corsets. Based on my research, the average middle-class NZ housewife in 1916 had between 1 & 3 corsets at any given time: 1 or 2 for everyday wear, and possibly a fancier, more constricting one for dressing up. Two corsets is ideal for everyday wear, because it means one can be airing while you wear the other. Previously all of my 1910s corsets have been based on my personally fitted draft of the 1911 corset in Janet Arnold’s book. However, very few women in NZ would have had personally fitted corsets. The 1910s corsets I have studied in NZ collections show clear signs of uneven rubbing, where the body in the corset didn’t exactly match the cut of the corset. So I thought it would be a good idea to have a corset made exactly from a period pattern, without fitting it specifically to me. I also wanted a corset from the mid-teens, rather than the early teens. Enter the 1916 German Ersatz corset pattern in Jill Salen’s Corsets: Historical Patterns & Techniques. Fraternising with the enemy is a bit scandalous, but it’s one of the only mid-teens patterns out there! Although the Ersatz corset dates to 1916, I’m reasonably sure that the base pattern wouldn’t have been significantly different to one from 1914. The only thing that may have been changed is the looser fit at the bottom front of the corset (note how flappy it is in the photo above), which would accommodate more movement than a tighter, slimmer fit. 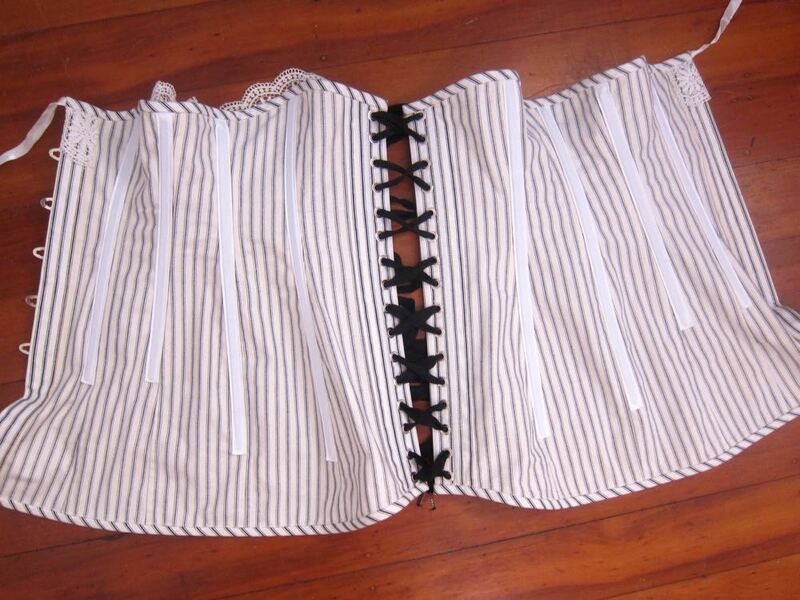 The pattern as drawn in Salen’s book is for a corset with a 22″ waist. I graded it up three sizes, which makes for a nice, easy to wear on an everyday basis corset, though I’ll probably go back down a size for any future iterations of this pattern. Although I went with a straight grade, the corset does fit me quite well. 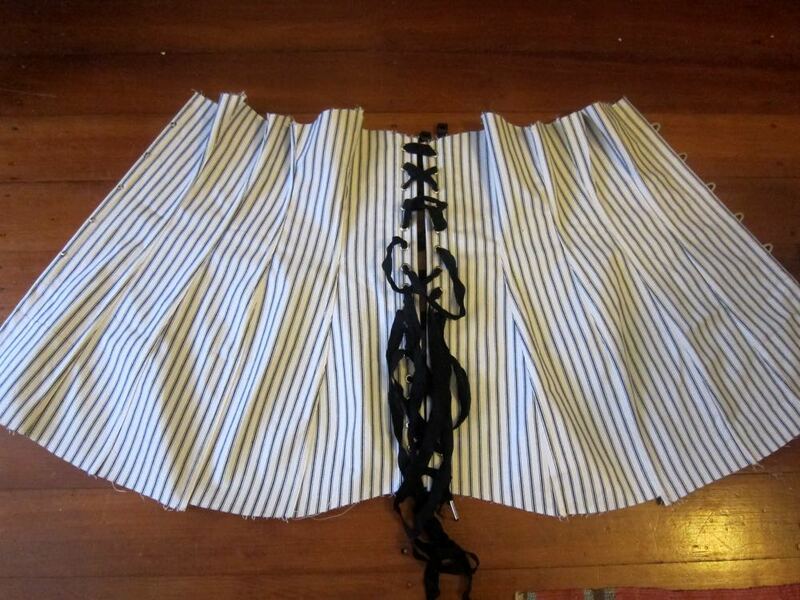 In general the pattern went together very easily, though there is almost certainly a major flaw in the busk measurements given in the pattern (they are drawn as if they are completely un-evenly spaced, but according to the photo of the extent corset they are evenly spaced), and the waistline does not line up from piece to piece. 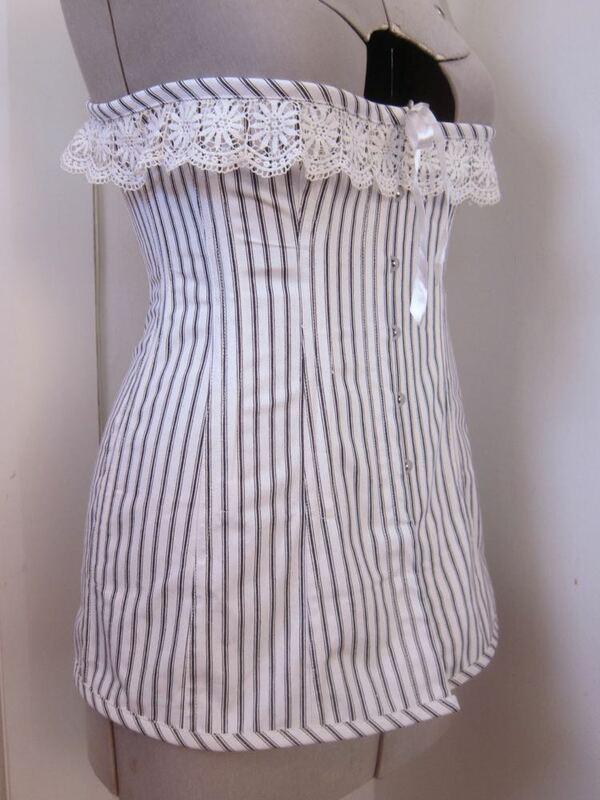 The corset is made from a single layer of black and white striped mattress ticking. 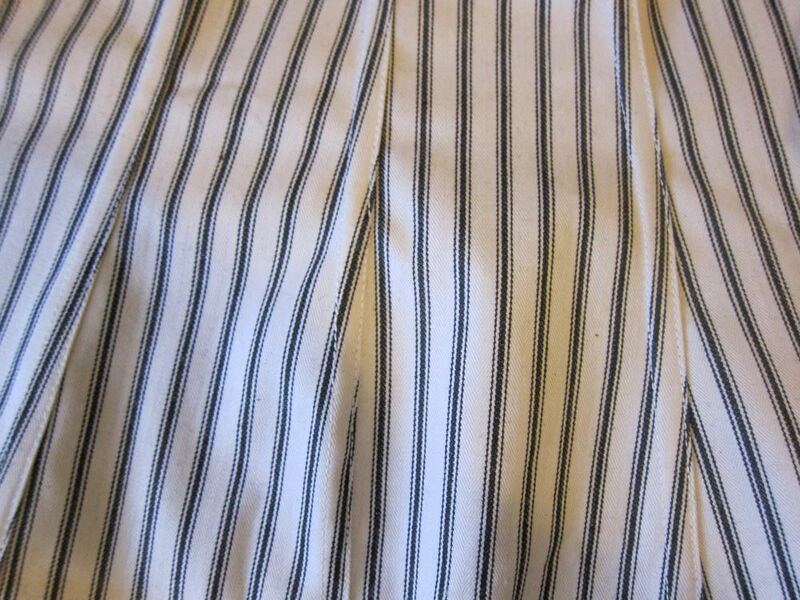 The seams are flat felled for strength (I LOVE flat felled seams. I have to restrain myself from doing them on everything!). It is boned with cable ties, and the boning channels are all made from separate boning tape. I had originally intended to use black grommets on the corset, but when I got out my grommeting equipment I could find all the black backs, but none of the fronts. Grrrr… So I had to go with antique silver. Now that is is finished, I’m quite glad I used silver grommets. 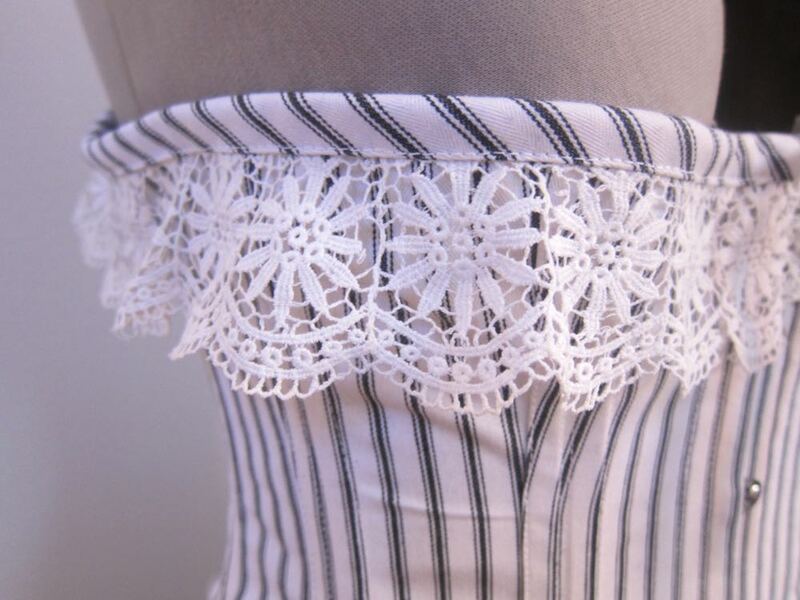 They work well with the white lace and the overall very restrained aesthetic of the corset. Speaking of the lace, it’s my favourite thing about the corset: I had exactly enough, and it completely makes the whole look. 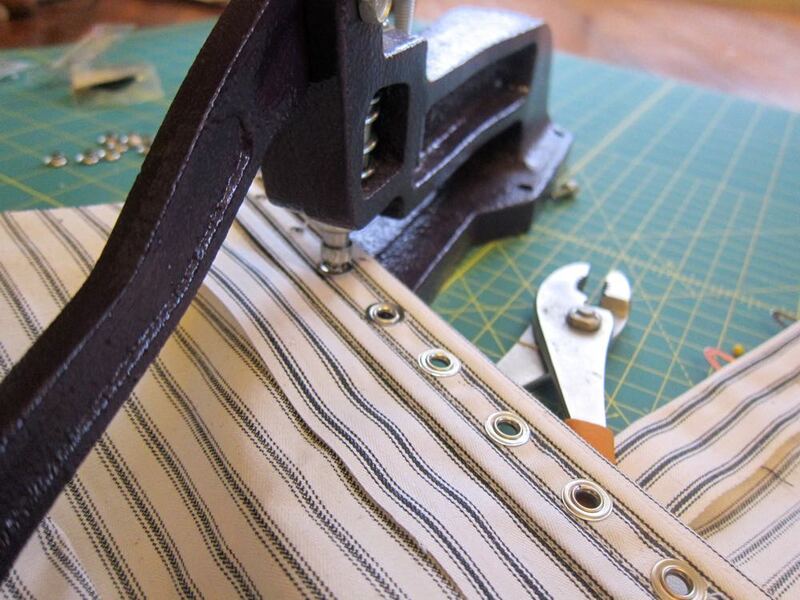 As I was sewing the corset it kept reminding me of something, and I finally did a search and realised that Bridges on the Body made a beautiful 1910s corset of black and white ticking, which of course I’ve seen, and other costumers have made black and white striped ones inspired by hers, so it’s become almost a ‘thing’. My inspiration wasn’t intentional, but I’m sure that subconsciously I remembered the others, and that’s why the fabric seemed so right. 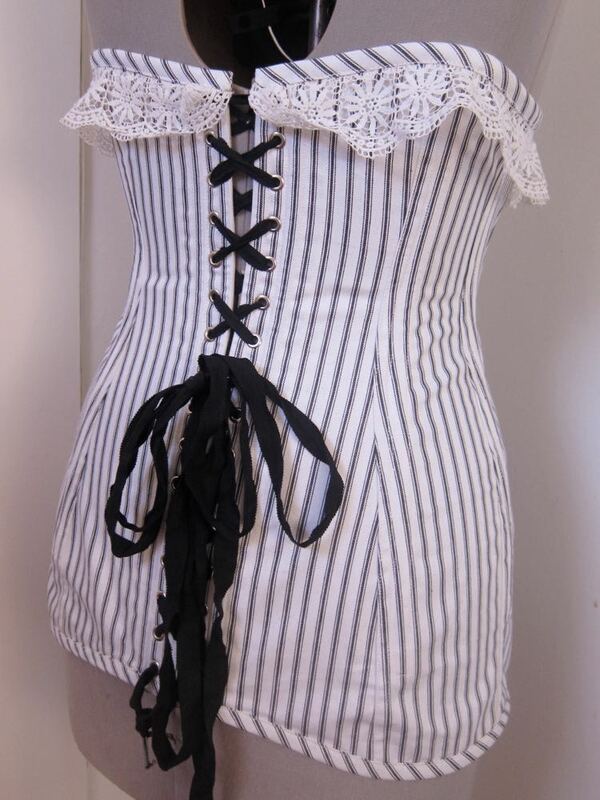 Luckily I like mine best of all the versions (which is good, because I have to wear it) 😉 Black and white can be quite aggressive, especially with a strong contrast, but the self fabric binding and the wide cotton lace tone down the stripes, and the overall effect is quite restful, which I feel is the correct look for a 1910s corset. It wasn’t an era of assertive undergarments! 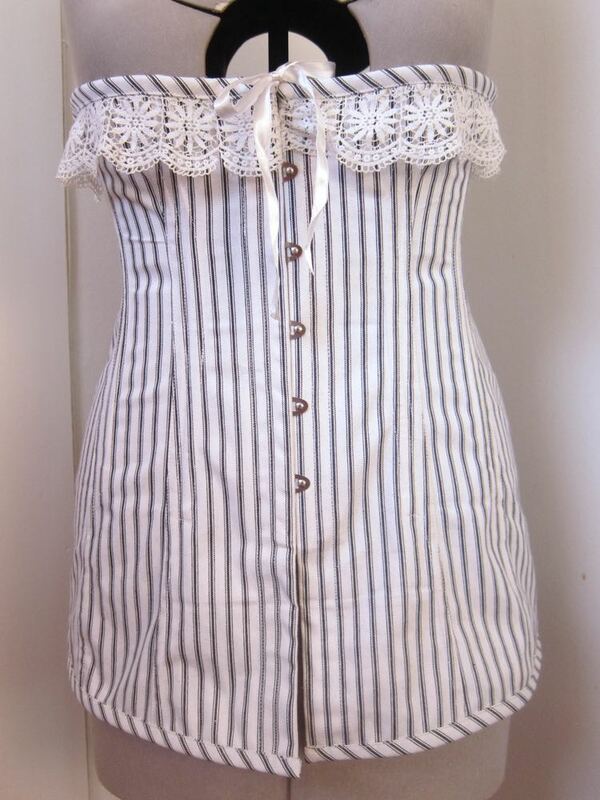 What the item is: a 1916 corset. Notions: 1 11″ busk (NZ$20), 1m of vintage cotton lace ($NZ4), 3m corset tapes (NZ $12), cable ties (approx $NZ5), rayon grosgrain corset lacing (approx NZ$8), cotton thread (NZ$1). Hours to complete: 14, if you include grading the pattern. First worn: Only for try-ons, but starting on Monday I’ll be living like it’s 1916 for two weeks, so it will get worn every other day. Beautiful, and it looks very comfortable. I’ll be interested to learn how you find wearing a corset not tailored to your figure – one of many little reasons I love this project! sewcharacteristicallyyou.comI am definitely looking forward to hearing about the 1916 project as you go along. I don’t know that I would ever go so far in my historical passion as to try as much as possible to live in the day, but I am definitely interested in hearing how it goes with the corset. Where do you get your buses from? This looks quite a comfy corset by the way. 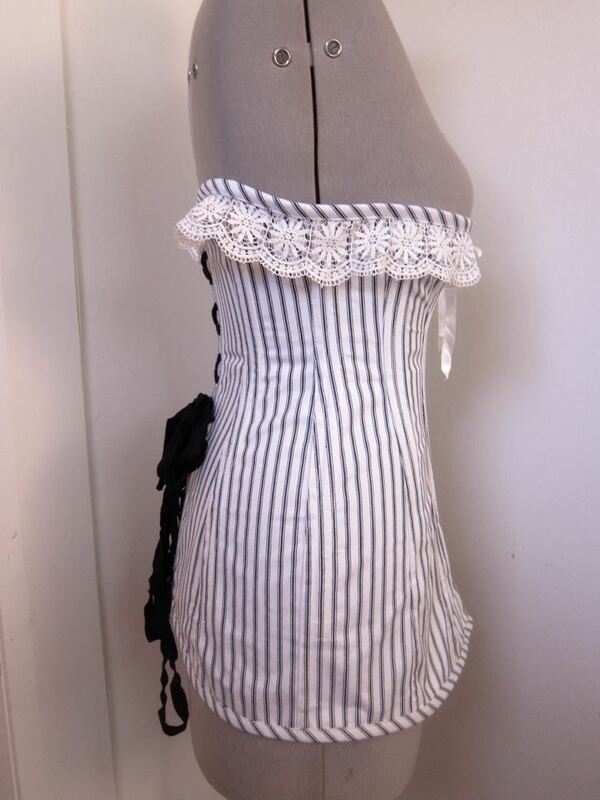 It looks so good with the matched stripes and the lace edging. It also looks reasonably comfortable, which is very important when you’re going to be wearing it every other day. Even though the stripes aren’t documentable it’s accurate to the spirit of the times, and every girl wants attractive underwear, even if there is a war on. You’ve made a “ready to wear” corset! Having been enjoying your blog as long as I have and reading about and seeing your meticulous work, this corset may drive you to distraction. It’s in the name of research, history and compassion. Kudos to you for living the life of a 1916 New Zealand, mother, wife, sister. What a tribute to those women. What are the measurements of this pattern? I have the book, but measuring without scaling up can be inaccurate (I’ve been off by multiple inches before). Also, is this a mid- low- or underbust level at the top?